Much as Higher Education would like to think it has a monopoly on learning, it is merely one in many, many layers in the learning cake. There is no monolithic MOOC audience. MOOCs are and will become increasingly varied in terms of audience, subjects and pedagogy. This is the big difference between institutional audiences and online audiences. It’s similar to the fractional distillation that has taken place as TV viewers move from scheduled programmes, to catch-up, to on-demand, to boxed sets. MOOCs are not campus courses, they’re online and subject to the behavioural habits of online learners, not the campus. There’s a big difference. 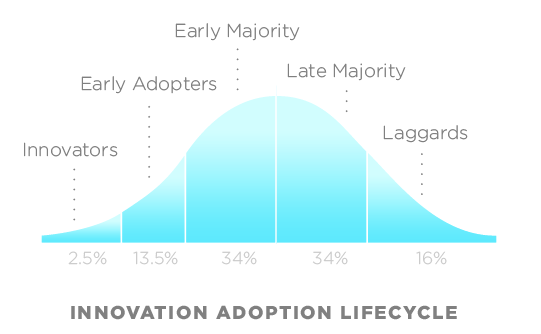 A more analytic approach is to use the work of Rogers and recognize that disruptive innovation is first used by ‘innovators, then ‘early adopters’, before moving into the early majority. It should not surprise us in the least that the innovators and early adopters are highly educated, with high social and financial status, time and close contact with the innovators and the channels they use. Note that these early adopters are not young tecchies but older people who are immersed in education. The first wave of MOOCs were made by Universities and the innovators and early adopters, naturally inhabit that space. Now that MOOCs are being created and marketed beyond the early adoption phase into the early and late majority, we will see, and already do see, different audience profiles emerging. What you don’t do is condemn an innovation before it has had exposure to the early majority. Things take time. A second factor, emphasized by George Siemens and others but seemingly ignored by many, is the simple fact that most MOOCs are ‘open’ in the sense that one can sign up in seconds. This means that there’s not much at stake in terms of commitment. Compare this to an expensive University course, where you will have spent most of your life at school working towards that goal, literally moved into new accommodation, possibly in a far-off place, where you know almost no one. On top of this you’ve paid a large sum of money for tuition, as well as more money on materials, travel, accommodation and living expenses. So, when you use the term drop-out, it suddenly becomes inappropriate. With online, you don’t hear about drop-outs from Wikipedia or YouTube, even long-format games. With lifelong learners completion is not always the goal or even desirable and the comparison starts to wane. Indeed, to compare MOOC registration and course completion with University course registration and course completion is almost absurd. The comparison is, if not odious, certainly odd. But let’s suppose you stick with the comparison. Look at drop-out rates in the US, as the famous Harvard study did (2012) to show that nearly half of America’s college students drop out before receiving a degree. The study found that only 56% of students in America’s colleges and universities graduate within six years, while only 29% of students in two-year programs complete their degrees within three years. High costs and crippling student loans are having an effect. In countries where there is a large and well-developed college and University system, this tends to be true. In for-profit colleges, the problem is even worse. More than three-quarters of for-profit students fail to earn a degree after six years, according to a 2011 report. All of a sudden, when you clean out the window shoppers from the MOOC completion data, the comparison is not half bad. So let’s re-evaluate what ‘massive’ means here? We know that registrations have been massive in terms of the total number of students registered, in the tens, and sometimes hundreds of thousands. But this top line figure is a measure of innovator and early adopter curiosity, interest, window shoppers, lurkers and learners. It is a heady fuel mixture of people who are just browsing to serious completers. So let’s try to unpack this early adopter data. We know a lot about online behavior, where the majority consume, a minority comment and an even smaller minority create. As rules of thumb we have the 90:9:1 or 89:10:1 principles, where only 1% create content, 9% comment and 90% lurk. Web masters and marketing people use analytics to look at bounce rate, page views and other metrics matched against goals to measure the success of their online efforts. With MOOCs it is likely that something more akin to these online habits and the Pareto principle is at work, with 20% of people accounting for 80% of the active learning. In fact MOOC completion rates, if that’s your goal are better than this. The problem we face with MOOCs is exacerbated by the fact that we are still in the early adoption phase where curiosity and window shopping are still key drivers skewing the data. 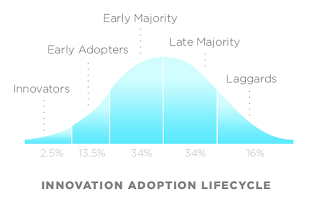 Early adopters tend to be those who are well-educated and well-versed in online activity. It will take time before the real numbers ‘settle’ into patterns that reveal real patterns of use. However, even at this early stage, we can try to identify sub-sets within the data. With MOOCs it is important to unpack the total registration number to reveal the true intent and behaviours of those who register. A useful distinction is between ‘active’ and ‘non-active’ learners, namely those who have gone beyond the opening of the course and show that they intend to persevere. Note that this does not necessarily mean complete. One could apply a simple criterion here, of those who persevere beyond a certain point in the course to show active participation and intent. This could be those who go beyond the first video, first assessment and further. I’d suggest that one needs to go further, and do a fair amount in their first visit with at least one active, repeat visit. They have no intention of carrying on or completing the course and are just plain curious. They are curious to see what a MOOC is, how easy it is to sign up. This group will diminish rapidly, when their curiosity is exhausted and MOOCs become mainstream. They may be looking at a whole range of courses on different subjects, a range of courses on the same subject, researching, writing a journalistic piece on, aggregating MOOCs on a website. They are there with intent but that intent has nothing to do with completion or certification. By far the largest group may be more than curious and register to try out the MOOC. They will be taking a temperature check in terms of the experience being too shallow/deep, easy/difficult, boring/engaging, irrelevant/relevant, to the point/long winded, esoteric/practical, didactic/open, poor quality/good quality and so on. They are still in judgment mode. As they are there without any financial or any other type of commitment, they are happy to simply have a peek. These are learners who are likely to already have a degree or track record in learning at an academic level. They are largely learning for the sale of learning and less interested in certification, even completion, taking what they want from the course, not being concerned about stopping. They are usually professionals with full time jobs, who find it difficult to stick to the timetabled regime of many MOOCs, especially Coursera. Even within this group we see ‘episodic’ and ‘binge’ learners. Episodic learners are busy and find it difficult to follow the standard undergraduate, week-by-week model. The course is either too fast or too slow for their needs. The binge learners has a few times when he/she can indulge in a deep bout of learning and doesn’t have the time to do it as regularly as the course demands. We are already seeing data that shows how overlong courses tend to work less well online and a move towards smaller or mini-MOOCs. This group have a natural tendency to see things through to completion. They don’t necessarily want accreditation and are happy with a Statement or Certificate of completion. These are likely to be younger learners who need certification to get into a course or job. They may also be looking to enhance or change career. This appropriate segmentation of the data makes a big difference to the reported numbers. For example, the six Coursera MOOCs run by the University of Edinburgh had 308,000 registrations with Statements of Completion. When, however, the identified the ‘Active’ learners, the figure was 21%. Decent analysis of MOOC learner data needs to avid the trap of seeing visitors as a monolithic lump. It is much more like web analytics where one is matching visitors against goals, and different visitors have different goals. It is reasonable to expect, that when MOOCs evolve they will become shorter and more engaging. I don’t see MOOCs as having to necessarily mimic the cohort campus model. If anything they will become less timetabled and more asynchronous, as this fits what we already know about what happens when offline phenomena go online. They shift towards on-demand, anywhere, anytime access. MOOCs are already morphing towards massive audiences well beyond the 18-year-old undergraduate model, into corporates, not-for-profits, lifelong learners, CPD, vocational and other areas of learning. HE is for a few years, learning is for life. Really interesting post - thank you. Just to say that of the MOOCs I have attended, one of the best, from my personal perspective, was also probably the longest - Change11, which was 35 weeks long - http://change.mooc.ca/week35.htm. I loved the format of this MOOC which really allowed for learner autonomy within a diverse, connected and open environment - and introduced participants to a wide range of experts and researchers. The conveners of the MOOC (Stephen Downes, George Siemens and Dave Cormier) I think decided, on reflection, that it was too long because of the high drop off rate - but I personally don't judge a MOOC on it's drop off rate, but more on it's content, ethos and philosophy. Change MOOC ticked all the boxes for me. It seems that you're saying that the trend is for people to dip in and out of MOOC's. In which case, aren't they simply MOOR's (Massive Online Open Resources)? If that's true, then what would you say is different about these to what the internet has been for many years? Yeas and no Mark. MOOCs are more structured than most OER and do offer various forms of certification, even accreditation. What we're seeing is a range of offers from the baseline Google, Wikipedia, YouTube; OER in the middle ground and MOOCs as more structured educational resources. Whats has been difficult is convincing the 'educational' world of teh relevance of onine learning. MOOCs are doing precisely this. The landscape is simply filling out, as it was always destined to. Could we have more mini-MOOCS that would last for a week or a day/hours in your opinion? Your blog posts remain informative and engaging as always. Aboslutely. A OOC should be as long as it needs to be, not something that mimics the old artifice of the 6/8/10/12 week semester. Adult learners are not full time academics or full time students, they are busy people who fit this sort of intense learning into their busy lives. Happy to come along. Have you seem my Hole in the wall research? I visited one inAfrica - complete failure.